There was a time when I was pumpkin obsessed. September would arrive and I would order Starbucks pumpkin spiced frappuccinos like they were going out of style. I'd stock up on cans of pumpkin puree...just in case I had a hankering for pumpkin cream cheese muffins later on in the middle of the summer. (I know, overboard.) These days, I'm a bit more balanced about the whole thing and spend more time trying to come to terms with shorter days and earlier bed times than I do the last hurrah of pumpkin season. This past week it dawned on me that we are in November and I had yet to bake anything with the kids for fall. 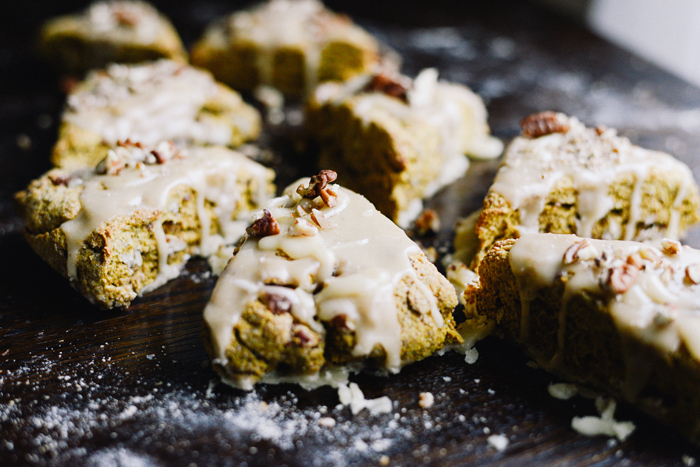 I had two cans of pumpkin in the pantry that I had been needing to use up and two rambunctious boys who needed a good hands-on project, so I decided to try these healthy pumpkin pecan scones. 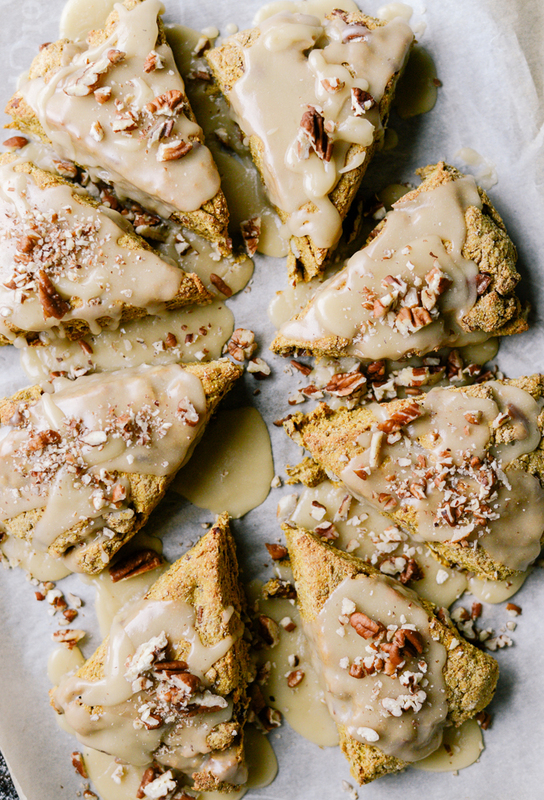 If I bake anything these days it is typically a breakfast that we can take with us on-the-go and these scones did not disappoint! I let the boys stir everything together and then I popped the dough into the oven, poured myself some coffee, lit a candle, pulled out a book and somehow all was right in the world. I found the juxtaposition of the nutty whole wheat flour and the smooth glaze absolutely addicting. 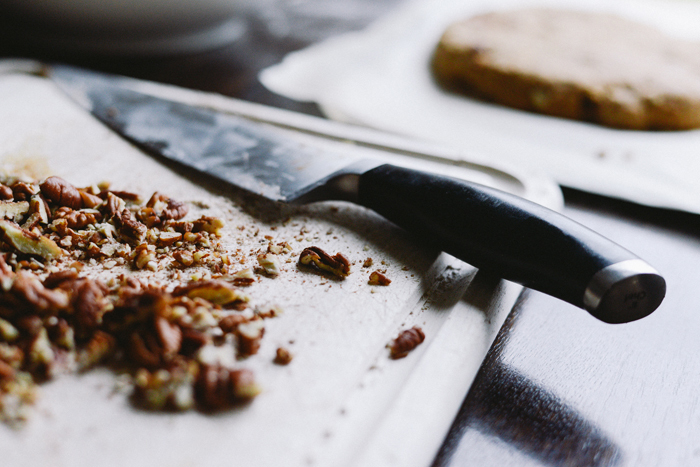 If you are not into nuts in your house, you can easily substitute them with chocolate chips. For a healthier option in place of the glaze (although, I highly recommend it!) try drizzling with plain maple syrup. Preheat oven to 425 degrees Fahrenheit. 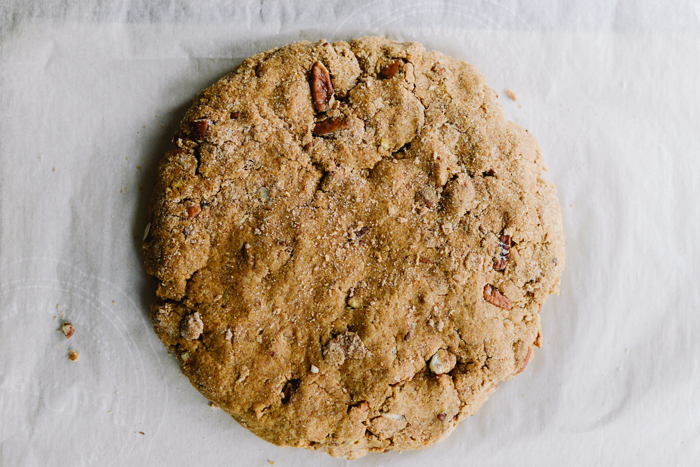 Place the nuts in a single layer on a rimmed baking sheet lined with parchment paper. 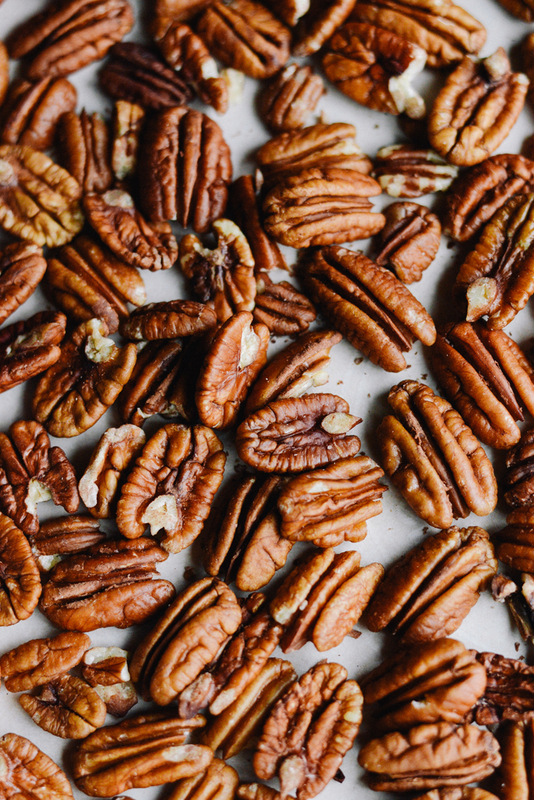 Toast the nuts in the oven until fragrant, about 3 minutes. Chop the nuts into very fine pieces. In a medium mixing bowl, combine the flour, ¾ths of the chopped nuts, baking powder, sugar, spices and salt in a bowl and whisk together. Use a pastry cutter to cut the coconut oil or butter into the dry ingredients. If you don’t have a pastry cutter, use a fork to cut the coconut oil into the flour, or use a knife to cut the butter into tiny pieces and mix it into the flour. Stir in pumpkin puree, milk and vanilla extract. At first it will seem like there isn’t enough liquid to wet the dough, but keep mixing until you have thoroughly incorporated the wet and dry ingredients. If you must, use your hands to knead the last of the flour into the dough. 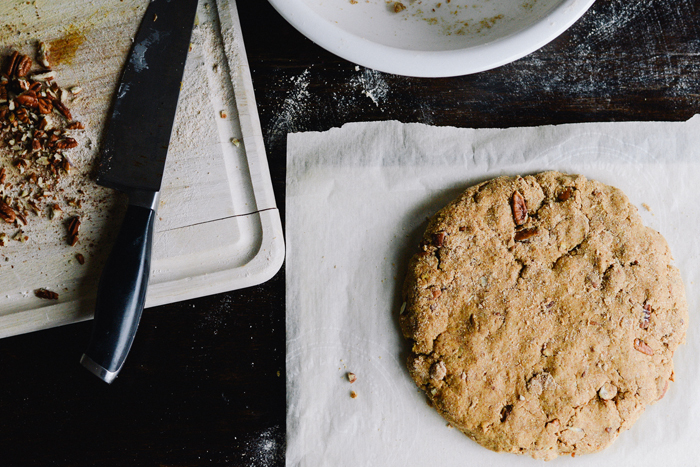 Form dough into a circle that’s about an inch deep all around. Use a chef's knife to cut the circle into 8 even slices. Separate slices and place on the baking sheet covered with parchment paper. Bake for 15 to 17 minutes or until lightly golden brown. While the scones are baking, whisk together the glaze ingredients in a small bowl until smooth and creamy. Drizzle the glaze generously over the scones (I preferred mine with a solid layer across the top). While the glaze is wet, sprinkle it with the remaining chopped nuts. Enjoy!